For other uses, see Paju (disambiguation). The city area of Paju is 672.78 km2 (259.76 sq mi), and it is located just south of Panmunjeom on the 38th parallel. In 2015, the population of Paju was over 427,000. To defend the South Korean capital, Seoul, many U.S. and South Korean army bases are set up in the area. In 2002, the northernmost South Korean railway station, Dorasan, was opened. North Korean territory and Kaesong City can be seen from Mount Dora in the city. Cosmos is Paju City's representative of flowers growing wild in Spring. It has very strong vitality, and symbolize unity and harmonious life as a citizen of Paju City. The flowers have different colors, including pale pink and red. Ginkgos are usually planted as street trees. People can obtain high-quality wood from them. Also, their leaves and fruits are used as a valuable medicine. Pigeons are meek and gentle with soft feathers which follow humans well. They symbolize the peace and security of mankind, and they mean to desire the unification of the Korean Peninsula and the well-being of citizens. The badge brings the look of Paju implicitly. Semiconductors, which symbolize high-tech industry, high-quality culture and books, and life based on the shape of the rice industry have represented the badge with the symbol Paju logo. Paju city has east and west low type of geographic trait. Many mountains are located in eastern Paju, assemble to create the border with Yangzhou. In northern Paju, mountains form the border with Goyang. Moreover, in central Paju some lower mountains spread toward south. For the major rivers in Paju, there are Imjin River and Han River. 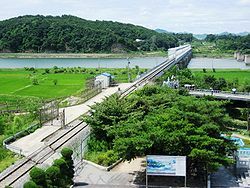 Imjin River flows between northern west and west, and Han River flows in western south of Paju. The average annual temperature of Paju is 10.5 ℃, the average January temperature is -4 ℃ and the average temperature is 25 ℃ in August. Lastly, annual precipitation of Paju is around 1,300㎜. Heyri Art Valley is the largest art village in South Korea. People visit the village to see Korean culture and lots of genres of art. The area includes residences, workrooms and galleries for artists, museums and performance spaces designed by lots of artistic people. It was planned from 1998 and its name Heyri is derived from a traditional farming song of Paju. Architects tried to combine the view of nature with the valley when they make plan. The valley provides lots of entertaining art performances which are diverse to all ages. The attractive theme brings people to visit every weekend, and more people visit the valley in spring and autumn because it holds art festival during the seasons. Jangdan beans are one of Paju’s famous traditional specialties. From a long time ago, crops have been important for Korean people’s livelihood because their land and environment were good for agriculture. Therefore, two major crops, rice and bean, have been developed over time. Jangdan bean is one of these crops which have been harvested in Paju. The name Jangdan is derived from the name of a village in Paju, which existed before the Korean War. Even though the village is now gone, people still call the bean the Jangdan bean because the former village was so well known for these beans. Today, Jangdan beans are only commonly seen In Panmunjom which is located at the border between South Korea and North Korea. The city has 3 polytechnic universities including Doowon Technical University College. Paju English Village is a huge area which was constructed to teach children English and let them experience western culture. Hundreds of foreign teachers are hired in the village. The educational village pushes ahead various curriculum to provide several educational programs called "English Camp". To attend the programs, children's parents have to pay and send children to the village for several days. The length of the program is depending on the type of program. People also visit the village because of its visual and new cultural atmosphere. Paju Challengers, an independent baseball team has been based in the city. The Cemetery for North Korean and Chinese Soldiers was established in 1996 to hold the remains of Korean People's Army and Chinese People's Volunteer Army soldiers killed during the Korean War. In March 2014 the Chinese remains were repatriated for reburial in Shenyang, China. Heyri Art Village – with 350 artists in fine arts, music, theater, photography, sculpture, crafts and literature. It aims to promote cultural interchange, education, and exhibit and sell hand-crafted works of art. Sim Sang-jung, former leader of the Justice Party (South Korea), member of the National Assembly (South Korea) representing Gyeonggi Goyang A, and 2017 South Korean presidential election. Lee Mi-Swel, contestant on K-pop Star, a South Korean talent show competition. It is the location of the 2009 film Paju, starring by Lee Sun-kyun and Seo Woo. Parts of Burning, South Korea's 2018 submission for the Academy Award for Best Foreign Language Film, are set in Paju. The Mnet survival show Produce 101 as well as its second season were filmed at the English Village. ^ a b c "Paju (Gyeonggi-do Province)." Naver Encyclopedia of Knowledge. Naver, 2015. 4 Mar. 2016. ^ Paju City. "Symbols of Paju."2016. Web. 4 Mar. 2016. ^ 100 Must-Visit Tourist Attractions. Gyeong Gi-Do, 19 May 2015. Web. 04 Mar. 2016. ^ Hwang, Gyoik. "Paju Jangdan Bean." A Loaf of Bread Is Better than the Song of Many Birds. Naver Cast, 3 Nov. 2009. Web. 4 Mar. 2016. ^ Yi, Hunbeomn. "Paju English Village Is Going To Open On Next Monday." Korea Joongang Daily [Seoul] 25 June 2010. Print. ^ "S. Korea, China to hold talks on remains of Chinese war dead". GlobalPost. Yonhap. January 20, 2014. ; "China to build new site for burial of its war dead from S. Korea". GlobalPost. Yonhap. February 16, 2014. ^ Lee, Cin Woo (16 March 2012). "Beyond Seoul: 19 reasons to explore Korea". CNN Go. Archived from the original on 21 April 2012. Retrieved 6 May 2012. ^ Lee Tae-hoon (February 20, 2012). "Business booms for illegal brothels on South Korea border". The Korea Times. Archived from the original on June 16, 2013. Retrieved June 22, 2013. ^ "Sister cities of Paju". Paju. Archived from the original on 22 July 2011. Retrieved 2 September 2010. Wikimedia Commons has media related to Paju, Gyeonggi-do.